Assessing the gaits of the equine can be difficult. Educating yourself on proper movement and watching multiple horses can help the average horseman to recognize proper or improper movement. The use of video is very useful as the stride is faster than the human eye can process. I want to talk about the common gaits of walk, trot, lope/canter and gallop. There are some breeds that pace or rack but due to length of this article, they will not be discussed here. Within each gait of the equine is what we call the stride. The stride has two phases. In the first phase the hoof is in contact with the ground. The limb is under concussion and compression forces are occurring during phase one of the stride. Phase two of the stride is the swing phase or movement of the hoof. As the heel leaves the ground, this is called break over. Then the toe pushes off, called propulsion. The walk is a four beat symmetrical gait. Propulsion for the walk starts in the hind legs and the front legs follow. For example, right hind, right front, left hind, left front. The walk also contains a diagonal which is difficult to see without video technology. The link at the end of this article shows a great example. The trot is a 2 beat, natural gait. The legs move together in diagonal pairs. For example, the right hind moves forward with the left front following and the left hind moves forward with the right front following. 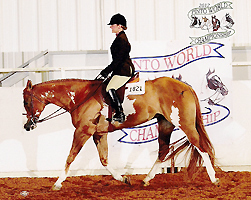 The trot has variations to the length of stride and rate of speed.